If you've ever tried to put photos on your website, you might have noticed it's kind of a pain. You've probably resorted to just dropping them into a folder so anyone viewing the site just sees a list of files. This is why I wrote GoodGallery. 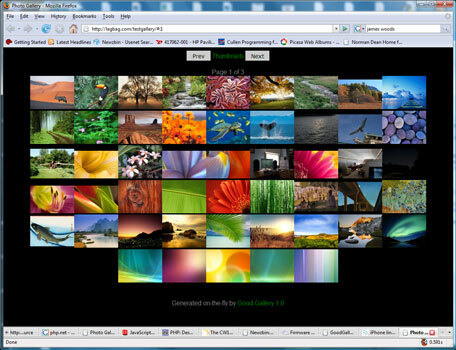 GoodGallery uses PHP to generate galleries *server-side*. Your website almost definitely supports PHP. It's everywhere. Just drop a bunch of images into a folder with the goodgallery file and you're done. It's that easy. If you want to make a change, just add or remove an image from the folder. Goodgallery keeps it all in order. If you have trouble with GoodGallery, please email me at cartossin at gmail dot com. I REALLY need to know about any problems so I can fix them. My goal is 100% foolproof software.